Back to Scotland for a time. Dawn from the yard at the our B&B on North Uist in the Hebrides. 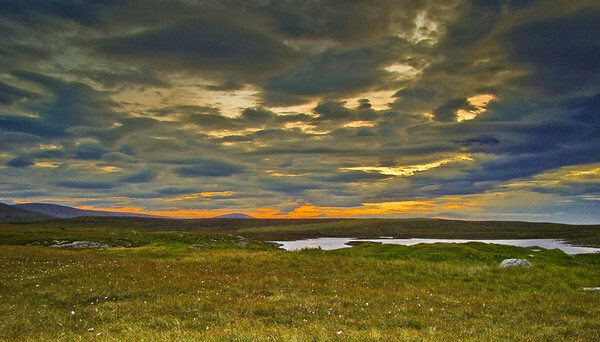 The sky dominated the landscape, but the landscape itself holds interest, with the lochs in the midground and the tiny flowers in the grass in the foreground. Exposure was particularly difficult as all the light was in the sky, and exposing for the sky left the foreground very dark. This is a shot that requires previsualization of the what can be done in postprocessing (and what can not). Only recently, months after my first attempts, have I leaned the tricks in Lightroom that get me close to what I saw while standing there. Sony DSC H50 at full wide (31mm equivalent). F4.0 @ 1/60th @ ISO 100. Programed Auto. In Lightroom I used three graduated filters. One down from the top to darken and intesify the sky. One up from the bottom to lighten the foreground and increase both global and local contrast. One in the center to intensify the dawn colors. Plus some Fill light to bring the foreground up even more and global adjustments for Vibrance and Clarity. Sharpen landscape preset.